A few days back, Google has updated Allo messaging app and added neural network-generated illustrations in Allo. 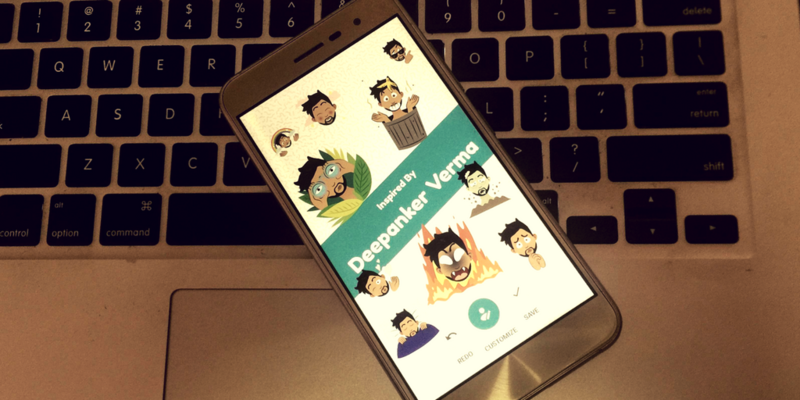 It allows you to create personalized stickers by using your selfie. Now the update is available to everyone and you can try this feature to make your conversation interesting. You also get the option to customize the illustration generated. You can change the shape of the face and add more things to change the illustration to look like you. When you are done, you end up getting 22 custom stickers. In this article, I will show you how to create your personalized selfie stickers in Google Allo and use in your conversations. First of all, you need to have Google Allo installed on your phone. If you do not have, install it from Google Play Store and create your account. It takes less than a minute in signup. It uses the mobile number to create a new account. After installation and creating the account, start a new conversation with a friend or open any existing conversation if you have any. At the left side of the text box to type your message, you see a + icon tap on it and select the stickers option. Here, you see an icon to add more stickers. In the new page, you see the first option saying “Turn a selfie into stickers”. Select it to turn your selfie into stickers. Tap on create button and capture a selfie. Make sure yo put your eyes inside the circles designed for capture eyes before you capture the photo. It will take few seconds to process and create your stickers inspired by you. It will also give you the option to customize if you are not happy with the results. You can also tap on “Redo” to recapture selfie and create stickers again. If you select customize, you will see an option to change face size, hair style, eyes, nose, and mouth. Once you are done with customization, you can save it to start using in conversation. The created stickers will have your persona touch. There will be 24 different stickers in this pack. They are as easy to use as you use other sticker packs. Just select any of the given stickers that fit your mood and it will be sent recipient. You can also share these stickers with other apps including WhatsApp and Facebook as an image. Sharing is also easy. Long tap on any sticker that you want to share and you will see a share option. Selecting that will open Android share menu that allows you to share sticker with other apps. See how I shared the sticker on WhatsApp. Google Allo has interesting features that make it worth to try the instant messaging app. I have this app installed but none of my friends are actively using it. This is the reason I am also not enjoying its features. Google is also trying its best to make this app interesting and attack more users. This recent sticker feature is worth to try. It will offer a better experience and you will be able to make your conversation interesting. Try creating personalized stickers on Allo and see if you find it interesting.